Secretary of State Hillary Clinton was honored with an American flag on Independence Day for her support of gay rights. The flag was commissioned by the Kaleidoscope Trust, the official charity partner for World Pride in London, and designed by American artist Sam Gassman. 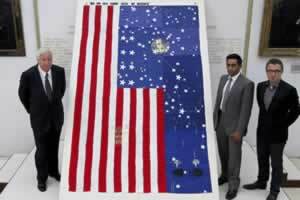 Sewn into the artwork is the full text of Clinton's speech on gay rights to the United Nations. In her 2011 address, Clinton condemned laws that discriminate against gay people as a violation of human rights. The flag was on display at the House of Parliament on Wednesday. A videotaped acceptance message from Clinton will be shown at a pride gala dinner on Thursday.